After an almost 1 month (oh my!) hiatus, I'm finally on to the third popcorn in my buffet. This was another sweet popcorn - very sweet, and used one of my favorite flavor combinations - peanut butter with chocolate! Yum! Personally, I think it's better than a peanut butter cup! Preheat oven to 300 degrees. Stir corn syrup and sugar together in a medium saucepan over medium-high heat. Bring to a boil, stirring constantly. Boil for one minute. Remove from heat and stir in peanut butter. Be careful - this is hot! Pour mixture over popcorn and stir to coat. Pour popcorn onto baking sheet and bake in oven for 10-15 minutes. 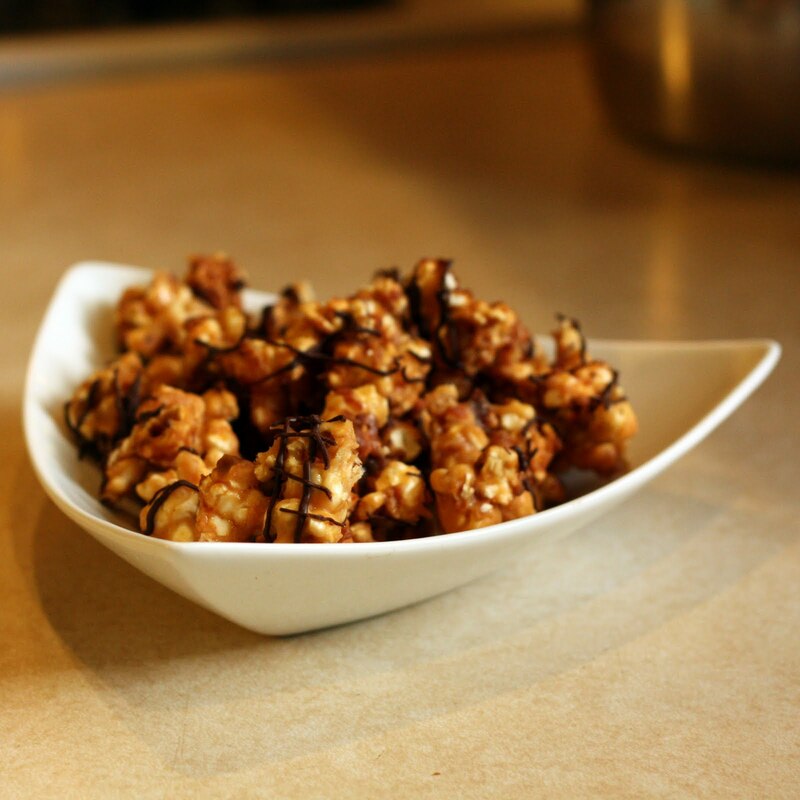 Spoon popcorn onto wire rack covered with waxed paper or parchment paper. Allow to cool completely. Melt chocolate chips in microwave, being careful not to scorch. Drizzle over popcorn and allow to set. Break popcorn into pieces. Store in airtight container.